Amazon Price: $73.50 $31.99 You save: $41.51 (56%). (as of April 26, 2019 1:42 am - Details). Product prices and availability are accurate as of the date/time indicated and are subject to change. Any price and availability information displayed on the Amazon site at the time of purchase will apply to the purchase of this product. 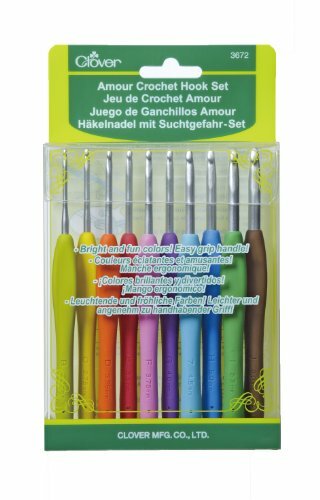 Anyone who loves to Crochet will adore these new Amour crochet hooks. 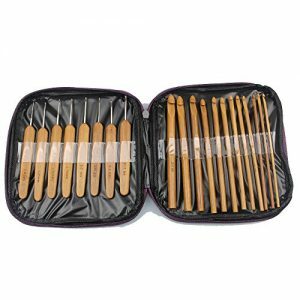 This set features a soft easy grip that is warm to the touch and gives the user the most comfortable finger placement as well as tireless functionality. The polished Aluminum hook is the perfect shape for smooth crocheting. 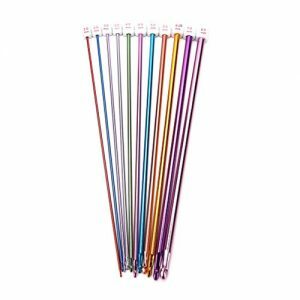 Each of the 10 sizes features a different bright and fun colored handle. The sizes are B-2.25mm, C-2.75mm, D-3.25mm, E-3.50mm, F-3.75mm, G-4.00mm, 7-4.50mm, H-5.00mm, I-5.50mm, and J-6.00mm.